For the Messiah did not enter a sanctuary made with hands (only a model of the true one) but into heaven itself, that He might now appear in the presence of God for us. For the Christ entered not into a holy place made with hands, representative of the true, but into heaven itself, now to appear in the presence of God for us. 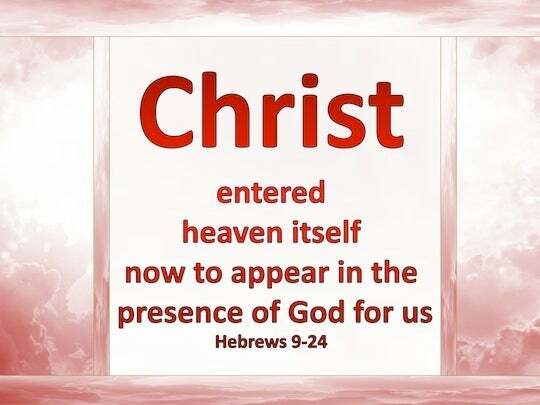 For Christ did not enter the Holy of Holies made by hand, which is [only] a counterpart of the true one, but into heaven itself, where He now appears in God's presence for us. [See verse 12]. For the Christ has not entered the holy places made with hands, the copies of the true; but he has entered heaven itself, now to present himself in the presence of God for us. For Christ did not enter a holy place made with hands, a copy of the true one, but into heaven itself, now to appear in the presence of God for us. For it was not a sanctuary made by human hands and only copied after the true one that Christ entered, but he went into heaven itself, in order to appear now on our behalf in the very presence of God. For Christ did not enter into the holy place made with hands, the figures of the true; but into heaven itself, now to appear in the presence of God for us. For Christ has not entered into the Holy of Holies made with hands, which are the figures of the true, but into Heaven itself, now to appear in the presence of God for us. For Christ is not entered into the holy places, that are made with hands, which are but similitudes of true things: but is entered into very heaven, for to appear now in the sight of God for us. 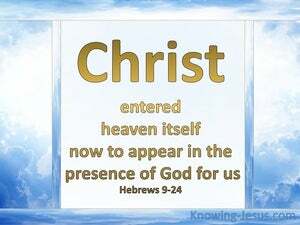 For Christ has not entered a holy place which human hands have made (a mere type of the reality! ); he has entered heaven itself, now to appear in the presence of God on our behalf. 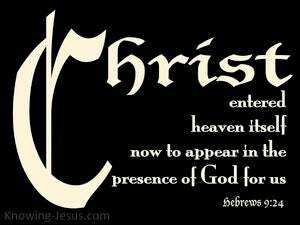 For it was not into a Sanctuary made by hands, a mere type of the reality, that Christ entered, but he entered into heaven itself, now to appear in the very presence of God on our behalf. For Christ did not enter a sanctuary made with hands -- the representation of the true sanctuary -- but into heaven itself, and he appears now in God's presence for us. For Christ did not enter into a sanctuary made with hands, which is only a copy of the true one, but into heaven itself, now to appear in the presence of God in our behalf. For it was not into a Sanctuary made by human hands, which merely foreshadowed the true one, that Christ entered, but into Heaven itself, that he might now appear in the presence of God on our behalf. For not into a Holy place built by men's hands--a mere copy of the reality--did Christ enter, but He entered Heaven itself, now to appear in the presence of God on our behalf. For it was not a sanctuary made by human hands, a mere copy of the true one, that Christ entered, but it was into heaven itself that He went, in order now to appear for us in the very presence of God.